One of the most traditional cures for almost anything is apple cider vinegar. Over the centuries, the ancient folk remedy is touted to relieve just about any ailment you can think of including diabetes, obesity and even cancer. Here’s what science has found. Apple cider vinegar (ACV) became well known in the U.S. in the late 1950s, when it was promoted in the best-selling book Folk Medicine: A Vermont Doctor’s Guide to Good Health by D. C. Jarvis. During the alternative medicine boom of recent years, apple cider vinegar and apple cider vinegar pills have become a popular dietary supplement. Unpasteurized or organic ACV contains mother of vinegar, which has a cobweb-like appearance and can make the vinegar look slightly congealed. It’s the only way apple cider vinegar should be consumed. ACV is used in salad dressings, marinades, vinaigrettes, food preservatives, and chutneys, among other things. It is made by crushing apples and squeezing out the liquid. Bacteria and Yeast are added to the liquid to start the alcoholic fermentation process, and the sugars are turned into alcohol. In a second fermentation process, the alcohol is converted into vinegar by acetic acid-forming bacteria (acetobacter). Acetic acid and malic acid give vinegar its sour taste. Apple cider vinegar is purported to treat numerous diseases, health conditions, and annoyances. To name a few, it kills head lice, reverses aging, eases digestion, prevents flu, prevents acne, lowers blood pressure, reduces inflammation, kills fungus, regulate pH balance, dissolves kidney stones and helps relieve allergies, migraines, asthma, nausea, heart burn and wash toxins from the body. Can it really do all these things? You bet it can and more! But what does science say? Diabetes. The effect of apple cider vinegar on blood sugar levels is perhaps the best researched and the most promising of APV’s health benefits. Several studies have found that vinegar may help lower glucose levels. For instance, a study (White, A. Diabetes Care, November 2007) of 11 people with type 2 diabetes found that taking two tablespoons of apple cider vinegar before bed lowered glucose levels in the morning by 4%-6%. In another study from Arizona State University, subjects took a drink of 20 grams of apple cider vinegar and 40 grams of water. Those with insulin resistance who drank the vinegar had 34% lower postprandial (after-meal) glucose compared to controls. Vinegar may be the most cost-effective medicine in history, but most people with diabetes still aren’t taking it. High Cholesterol. A 2006 study reported in Medscape General Medicine, showed evidence that ACV could lower cholesterol. In a study published in a foreign medical journal, scientists found an apple cider vinegar-enhanced diet may increase in HDL (good cholesterol), and reduce levels of triglycerides. Research in rats suggests that apple-cider vinegar can help control triglycerides and cholesterol (Journal of Agricultural and Food Chemistry, June 22, 2011). Blood Pressure and Heart Health. Another study in rats found that vinegar could lower high blood pressure. A large observational study also found that people who ate oil and vinegar dressing on salads five to six times a week had lower rates of heart disease than people who didn’t. Researchers have suggested that ‘this reduction in blood pressure may be caused by the significant reduction in renin activity and the subsequent decrease in angiotensin II’. Potassium in the vinegar ‘balances sodium levels in the body, which aids in maintaining blood pressure within healthy limits’ and ‘apple cider vinegar also contains magnesium, a mineral that works to relax blood vessel walls and thus lower high blood pressure’. Cancer. A few laboratory studies have found that vinegar may be able to kill cancer cells or slow their growth. One study found that eating vinegar was associated with a decreased risk of esophageal cancer. Another associated it with an increased risk of bladder cancer. In recent trials, pectin, which can be found in ACV, has shown promise in helping to slow the growth of cancerous cells within the prostate (http://www.news-medical.net/news/20100702/Modified-Citrus-Pectin-holds-promise-against-prostate-cancer.aspx). 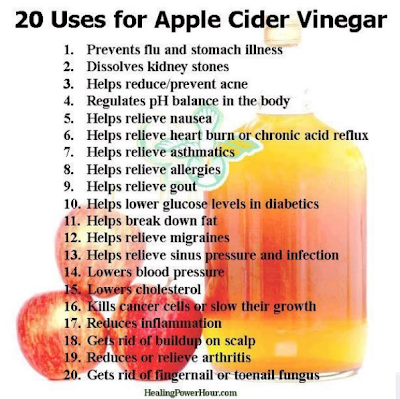 In addition, apple cider vinegar’s acidity aids in detoxifying and cleansing the digestive tract and cleaning out the colon, which supports the health of the prostate as well. Weight Loss. For thousands of years, vinegar has been used for weight loss. White vinegar (and perhaps other types) might help people feel full. A study (Ostman, E. European Journal of Clinical Nutrition, 2005) of 12 people found that those who ate a piece of bread along with small amounts of vinegar felt fuller and more satisfied than those who just ate the bread. A 2009 study on mice showed that consuming acetic acid (the active component in ACV), upregulates the expression of genes for fatty acid oxidation enzymes in the liver causing a suppression in body fat accumulation. In a double-blind experiment, obese Japanese were assigned to three different groups based on similar body weights, body mass indexes (BMI), and waist circumference. Each group drank a 500 ml drink containing either 30ml, 15ml, or 0ml of vinegar daily for 12 weeks. Those in the 30ml and 15ml groups had lower BMI, visceral fat area, waist circumference, serum triglyceride, and body weight to the control group of 0ml. The 12-week weight losses were modest: 1.2kg in the 15ml group and 1.7kg in the 30ml group. These two groups consumed a similar number of calories to the control group and also performed a similar amount of exercise, so the effect is not likely to have been due to an impact on appetite or other lifestyle changes. It was concluded that consumption of vinegar might reduce obesity. Apple cider vinegar is chosen over white vinegar for many processes involving the elimination of fungus. Although they both have highly acidic properties; apple cider also contains detoxifying qualities that will clear up other skin allergies. No side effects have been found when treating the skin with apple cider vinegar, making it a cost effective and safe remedy. Here are many other benefits of apple cider vinegar that can be applied to your lifestyle. Read the list below. Hair: It is widely known that apple cider vinegar can be used as a rinse for your hair after shampooing to add healthy body and shine. Recycle an old shampoo bottle and fill it with 1/2 a tablespoon of apple cider vinegar and a cup of cold water. Pour through your hair after shampooing several times a week. Face: Did you know that apple cider vinegar can help regulate the pH of your skin? Dilute apple cider vinegar with two parts water, and spread the concoction over your face with a cotton ball as a toner. You can do this at night after washing, and in the morning before you apply your moisturizer. You can also dab apple cider vinegar directly onto age spots and leave them on overnight to lighten their color. Hands and Feet: Are your hands and feet feeling tired and swollen after a long day? Treat yourself to a personal spa massage by rubbing apple cider vinegar onto them. Sunburn: Suffering from a bad sunburn? Add a cup of apple cider vinegar to your bath and soak for 10 minutes. Teeth: Did you know that apple cider vinegar can help remove stains from teeth? Rub teeth directly with apple cider vinegar and rinse out. Aftershave: Fill a bottle with equal parts apple cider vinegar and water and shake to blend. Detox: Add 2 tablespoon of apple cider vinegar to a 1 or 2 liter filtered water bottle. Drink this throughout the day to cleanse your body and kidneys all day long. Drain Cleaner: Baking soda and apple cider vinegar is an amazing bubbly combination that has many uses. As a drain cleaner, sprinkle baking soda down the drain then add apple cider vinegar and let it bubble for 15 minutes, then rinse with hot water. This is a safer alternative to dangerous drain cleaners. Digestion: A small amount of apple cider vinegar, taken just prior to a meal, will stimulate production of digestive juices. Dandruff: A home remedy for dandruff is to mix 1/4 cup apple cider vinegar with 1/4 cup water. The vinegar solution is thought to restore the restore the pH balance of the scalp and discourage the overgrowth of malassezia furfur, the yeast-like fungus thought to trigger dandruff. Mosquito and Insect Bites: Using as little as 1/4 teaspoon of apple cider vinegar will relieve insect bites instantly. Stomach Aches: Mix 1 tablespoon of organic apple cider vinegar with 12 ounces of warm water, and drink in the morning on empty stomach. Feel free to add a little honey or maple syrup. Alkaline Acid Balance: Some alternative practitioners recommend using apple cider vinegar to restore alkaline acid balance. The theory behind the alkaline diet is that our blood is slightly alkaline (with a normal pH level of between 7.35 and 7.45) and that our diet should reflect this pH level. Proponents of the alkaline-acid theory believe that a diet high in acid-producing foods leads to lack of energy, excessive mucous production, infections, anxiety, irritability, headache, sore throat, nasal and sinus congestion, allergic reactions, and increased risk of conditions such as arthritis and gout. Tagged alkalinity, apple cider vinegar, cancer, cholesterol, detox, diabetes, weight loss. Bookmark the permalink.